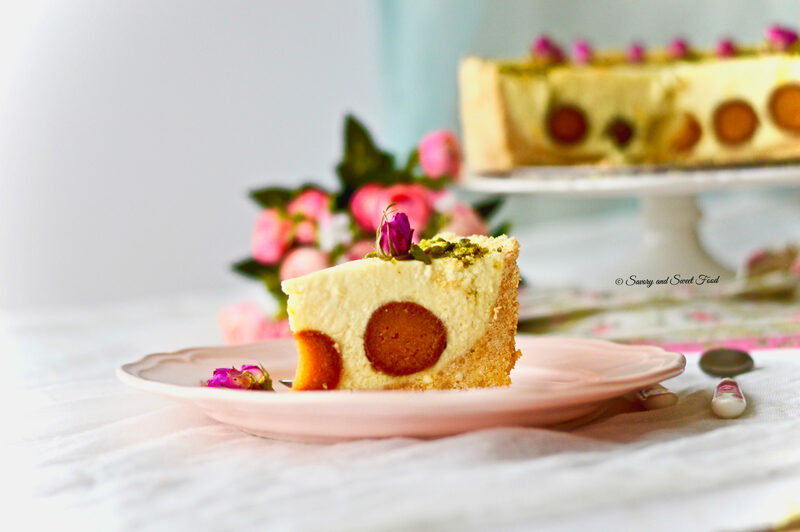 GULAB JAMUN CHEESECAKE, an Indian cheesecake made with paneer, hung yoghurt and gulab jamun. 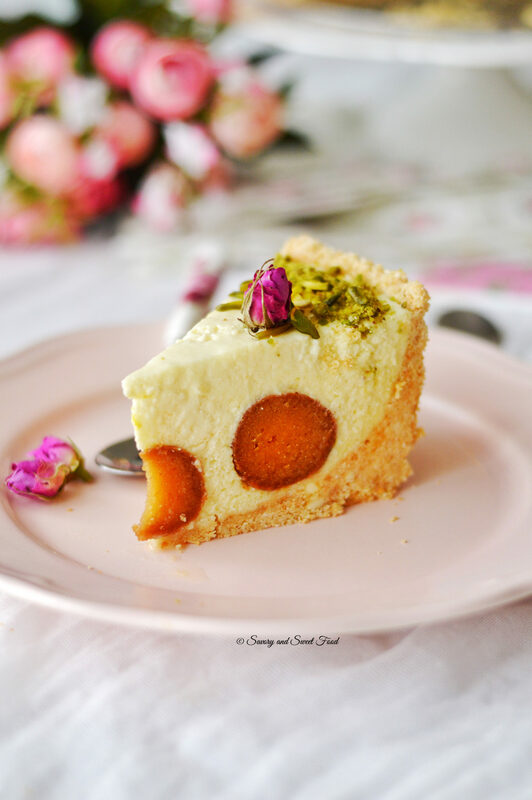 Did you ever have a craving for Gulab Jamun and Cheesecake at the same time? Well, this one is for you then :). You must be having doubts on the combination of these two classic desserts. And I can understand that, I had the same feeling when I saw it for the first time in India’s most loved chef Sanjeev Kapoors show. I made a few changes here and there from the original recipe according to my taste and gave it a try. And when I mixed two of my most favourite desserts into one it was magic. I was so impressed with the result that I made it thrice in two weeks, seriously, no kidding! 🙂 My family and friends loved it. Such a yummy Innovation! In this recipe I haven’t used cream cheese, instead I used our very own Indian cottage cheese, Paneer. For the slight tartness, hung yoghurt is used here. Combination of Paneer, yoghurt and sweetened condensed milk is simply amazing. 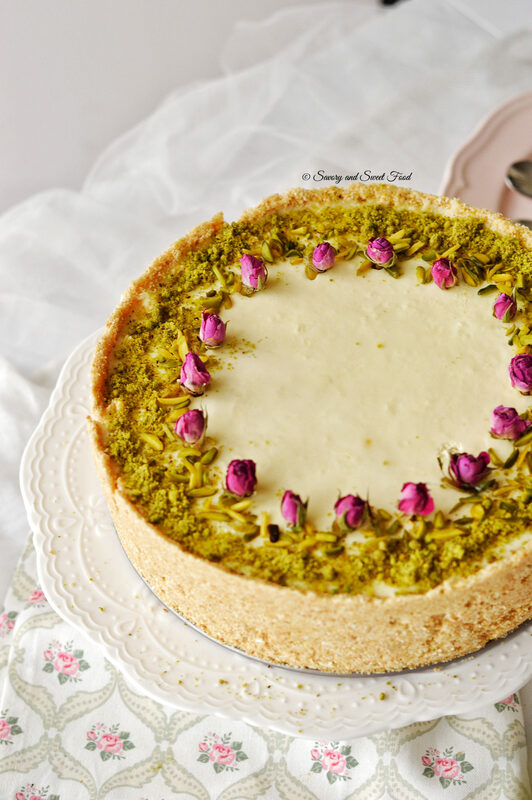 This one is a no-bake cheesecake, it is set with gelatine. Vegetarians can replace the gelatine with either agar or carrageenan. It is very very easy to make the cheesecake mixture. You just have to blend paneer, condensed milk, cream and yoghurt in the blender. Mix in the gelatine, saffron and keep it to set. No whipping or whisking is required. Make sure to strain the gelatine before adding it to the paneer mix. Check for the sweetness and add more or less of condensed milk according to your preference. If you don’t like the taste or smell of saffron, omit it. Do not use the yoghurt as it is. Hang the yoghurt in a muslin cloth or put it in a strainer overnight in the refrigerator and then use the thick yoghurt. 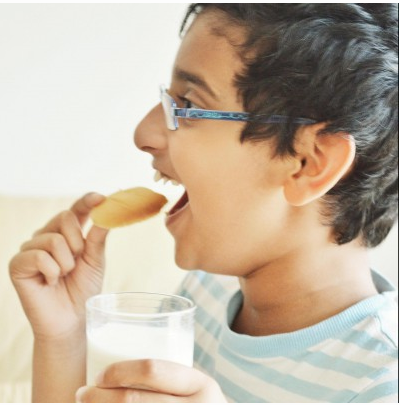 If your paneer is frozen, just heat it in the microwave oven till it is soft and then crumble it. In a medium bowl, combine the biscuit crumbs and cashews. Stir in the melted butter and mix until well-combined. Press the mixture into the bottom and 1- or 2-inches up the sides of a 9-inch springform pan. In your blender, blend together the paneer, condensed milk, hung yoghurt and cream. Blend well until smooth. Meanwhile, take some saffron in a glass and pour in milk. Microwave it for about 20 seconds. Let it cool. Also in a small bowl add in gelatine and warm water. Mix. Microwave this also for about 30 seconds till it is well dissolved. Let that cool slightly. Pour the paneer mix into a large bowl. Add in the saffron, cardamom powder and gelatine. Make sure that you pour the gelatine through a strainer. Mix well. 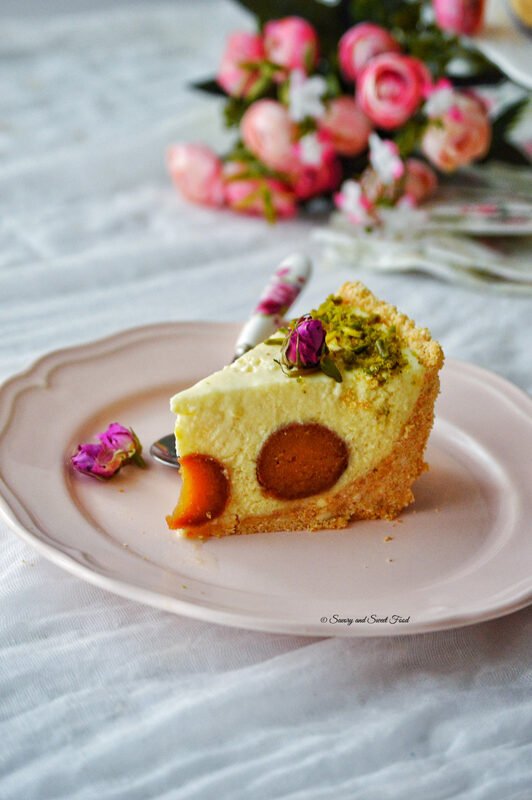 Take out the biscuit base from the refrigerator, place a layer of gulab jamun. If the gulab jamuns are big, then cut it into half. Pour the paneer mix over this. Refrigerate for 4 hours minimum. If you don't like the taste or smell of saffron, omit it. Walaikumsalaam Sunithatha! I was actually thinking of writing to you to ask if all is good. Have not seen your comment for long. Sad to know about the accident. Do take rest. Thanks a lot for the lovely comment. Yes those are edible roses. Have you seen the video? I think it didn’t get embeded in the post when you opened. 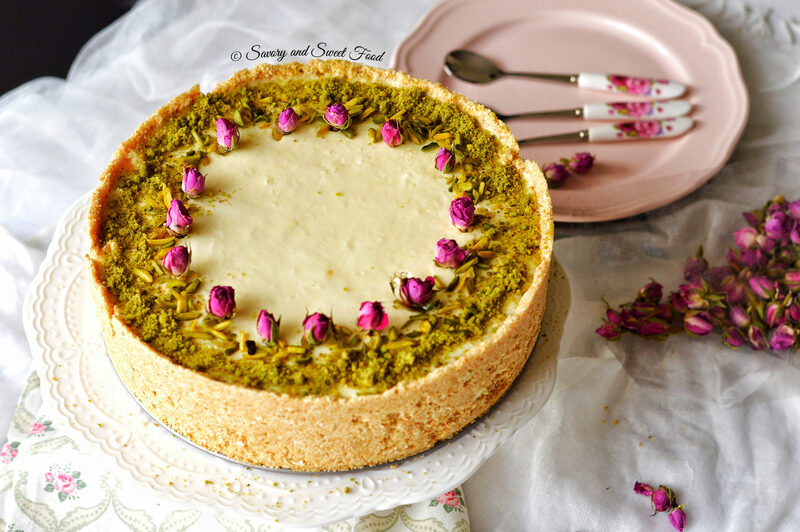 Oh my god!what a beautiful dessert Sadia!No words.Stunning photography too!Will try this for sure. .. Thanks Wafa! In shaa Allah I will post sometime. I used readymade mtr brand gulab jamuns here. Paneer is a cheese commonly used in India. It is made by curdling heated milk with lemon juice or vinegar. It is crumbly and moist. If you are from the middle east it will be easily available in most of the supermarkets freezer section. If not try the Indian stores. You can make it at home too. Is it cream or cream cheese that you gave used? No dear. Without panner or hung curd it will taste completely different. These two are the main ingredients in the cheesecake. That’s okaay! 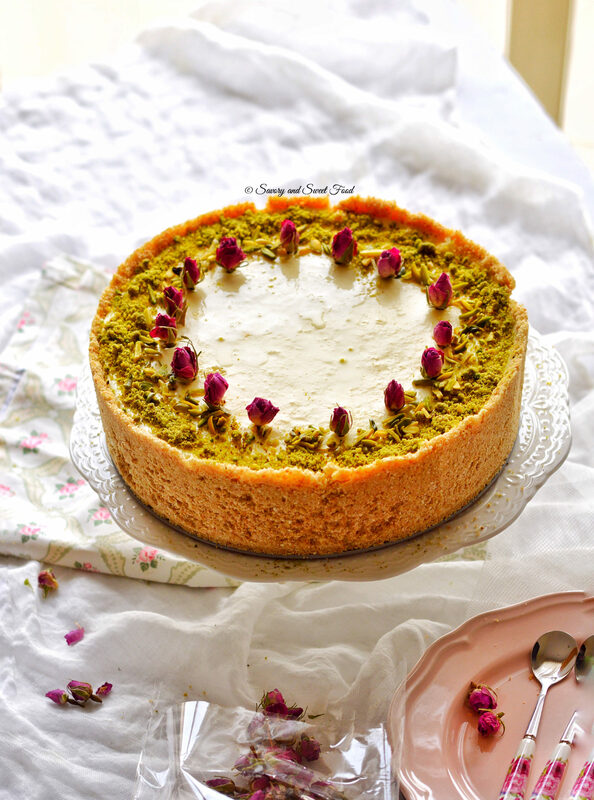 Hope the cheesecake turns out to be a hit in your place. Please let me know. Is it possible to use Philidelphia cream cheese and greek yogurt instead of paneer and hung yogurt? If yes, then in what quantities? Hey Rahma! I have not tried making this cheesecake with cream cheese, but I guess it would be fine if you use cream cheese. Take the same 1 1/2 cup measurement like paneer. Greek yoghurt can be used too. I recently saw ur website and I must say I’m hooked to ur blog. I’ve made few recipes for iftaar and they taste great .my whole family loves it. Thanks so much for all the hard work and keep the recipes coming. May allah bless you with health ,happiness and more creativity for yummy recipes 🙂 Searching for halal gelatin has been futile. I’ve found agar agar. Could you tell how much I should use and the. Method to prepare it. Welcome dear! Really happy to have a new follower. I am very glad that you are hooked on to the blog. Hope you will be glued here always. Yes, you can use agar instead of gelatin. For this recipe use 5 grams of it. Just soak it in water for half an hour. Then boil it in about half a cup of water or just enough water to cover the agar. Boil till it is completely dissolved. Cool it a bit, strain it and pour into the cheesecake mix. Hope you got it. Do let me know if you have any more doubts. Thanks for the cook response. I got all the ingredients today. I have a follow up question.Can agar agar be boiled. I was reading online if gelatin is boiled it doesn’t set. I was wondering if it’s the same case with agar agar too. Yes Saby, agar should be boiled. Only then it will get dissolved. But gelatin shouldn’t be boiled like you said. Make sure that the agar cools down a little bit before pouring into the cheesecake mixture and also strain it and pour. Very beautiful dessert. In sha Allah will definitely try. May I know whether the gulab jamuns are added before adding to the sugar syrup or after adding? Thank you. You have to use gulab jamun soaked in syrup. I used the readymade canned gulab jamuns. Hope this turns out good for you. I was wondering if I can make it in advance and freeze/refrigerate it? If yes, how long will it stay good? Thanks! Yes, you can make it and refrigerate it for 2-3 days, not more than that. I am trying to make this. I generally make paneer at home. SHould i use the paneer as it is without putting in the fridge when i first stained and removed all water? Also, by cream you meant here, heavy whipping cream churned to peak and then used 1/2 cup or cool whip cream? Homemade paneer will be better than the frozen one. Just make sure that you have drained all the water. By thick cream I meant fresh cream. Not whipped cream. Here in the Middle East we get a clotted cream like thick cream. But if you don’t get any of these, just use whipping cream. Once you blend it with all the other ingredients it will thicken a little. Hope this cheesecake turns out good for you. Let me know. Thanks for the quick reply. I will surely send u picture of how it will turn out. Can you also tell me how much agar powder to use instead of gelatin and any specifications to follow while using agar powder. Gelatin. Can we use unflavored vegan jel? Or just Agar is better? Very sorry for replying late. I would recommend using agar. I haven’t heard of vegan gel before, so I really have no idea about it. Place a baking paper underneath. Then it will be easier to slide the cheesecake out of the pan. If still difficult, then use a flat spatula to slightly lift the cake from one side and then slide it out. I am planning to make this for my child’s birthday dinner next week. I want to make this as dessert shots, as I have to serve this for approx 40 people. 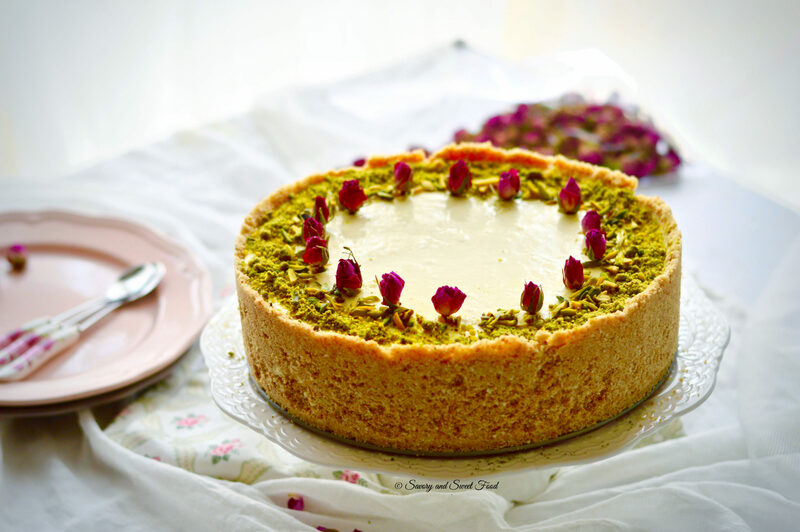 But I am going to make this type of dessert for 1st time. Can I follow the exact recipe, or you have any suggestion. Yes Deepali, you can follow the exact recipe. If you get mini gulab jamuns, it would be good when making shots. Hope your family and guests like this dessert. Please do let me know. And yes, I am going to use mini gulabjamuns. Hi thanks for your reply … also how did you get hung yoghurt . The gelatin how many spoons of gelatin to water did you use . Cream which brand did you use. I placed the usual yoghurt in a strainer and kept it in fridge overnight. The next day all the whey had drained out and I got thick yoghurt in the strainer. I mixed 1 tbsp of gelatin in 1/4 cup hot water. I used puck cream. You can use any brand actually. Hope this helped. Please let me know how it turned out for you. All the best. Glad to know that you liked this recipe. But I’m really sorry as providing the measurements in grams would be difficult now if you want it soon. I can update the recipe but it will take time. The measurement of the cup I used is 250ml, if this would help. You are most welcome. Hope you will like it. Hi! I tried this recipe but unfortunately it didn’t set. The mixture stayed runny…. any ideas where I went wrong?? Oh no! That’s sad. Did you follow the exact recipe? Maybe the gelatin you added was less or it must have not got dissolved well in warm water before adding it to the cheesecake mix leaving few undissolved gelatin back in the bowl. Hi Sadia, how are you doing? Must say that this dessert is simply wow ! A big thanks for sharing. I have made it a number of times using gelatin and everytime turned out perfectly fine. But when i put the same amount of agar agar powder, it did not set at all. Kindly advise. Where do you get edible rose petals? It will be easily available in old souks or spice markets in Kuwait/Dubai. Not sure about other places. You can check online too. Super excited to be trying out this recipe for a party of 20 tomorrow. I have doubled the ingredients and have just set my cheesecake to freeze with my crossed fingers and toes. Even if the end result looks 80% of what you have, I’d be pleased. Just one thought – for a novice cook like me, it will be helpful if you could add how many gelatin sheets you would use along with the number in grams (since we only managed to get gelatin sheets in the supermarket) and I took awhile to figure out the gm to sheet conversion after lots of Googling. Hey Divya. How did the cheesecake turn out? Hope it came out good for you. I am so sorry Divya, I don’t get gelatin sheets here, so I have no idea about it. If I come across that, I will definitely update the recipe with gelatin sheets measurement. Okay, something must have gone wrong with the conversion and the cheesecake didn’t set. Since I had seen this a few hours before the party (thankfully!) Husband dearest suggested we put it in the freezer to set it. This set the cheesecake perfectly but the base got too hard. We rescued it by serving the cheesecake pieces without the base. But the taste was great! Loved your recipe. 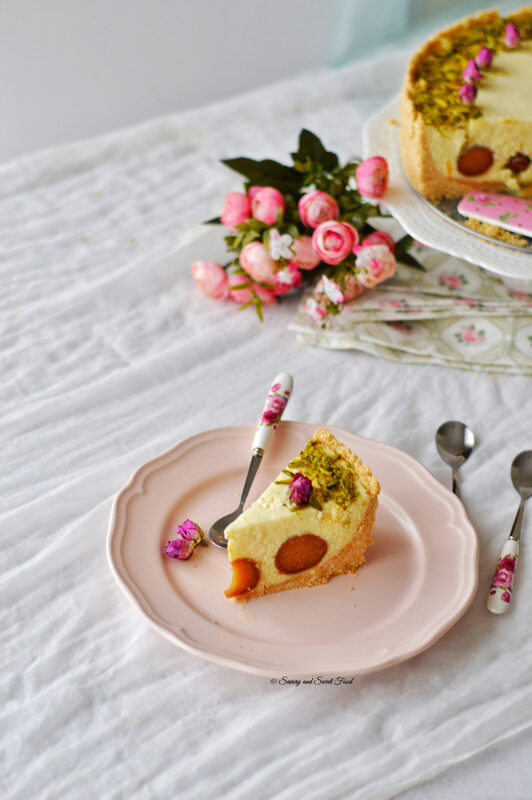 Can you please tell what kind of cream is used in this recipe. Can we make it at home? If yes, please share the recipe. Also what if I don’t want to use the gelatin? Want to try it very soon. The cake looks amazing. I am from the United States and want to know what cream to use? We have heavy whipping cream. Is that the one I should use? Thanks so much for the reply. I am making 2 of these for Thanksgiving . Will let you know how it turns out.